"[Owsley Brown] has gone on to have a notable career in documentary filmmaking, and Berkeley Art Museum and Pacific Film Archive is honoring him with a retrospective, “Owsley Brown: A Filmmaker’s Journey.” Screenings will feature his latest work, the feature “Serenade for Haiti” and the short “Offerings from Nangchen.” His 2000 Independent Spirit Award-winning debut, “Night Waltz: The Music of Paul Bowles,” and others of his earlier films also are part of the program." "Documentarian Owsley Brown does more than make movies. He’s a civic leader, a businessman, and a winemaker. And he’s made three feature-length films about music, all of which will be screened at the PFA. I’ve seen one of them, Serenade for Haiti. I liked it. The others are Night Waltz: The Music of Paul Bowles and Music Makes a City." 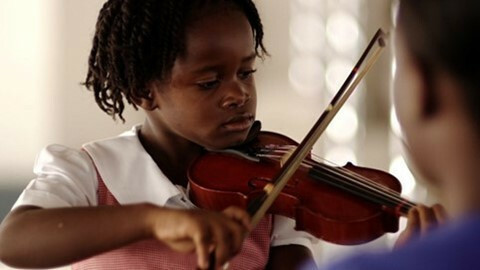 Serenade for Haiti featured in "Movie Magic in the 502" in Louisville's Voice-Tribune. Click here to read more about the Flyover Film Festival and films that will be screening. In the article, Louisville-born director Owsley Brown reveals that, "...one of the school’s most impactful past directors and one of the most important living Haitian composers, Julio Racine, made Louisville his home many years ago and still lives here today with his wife, Nina, who taught many students ... at the Brown School." The Nantucket Film Festival spoke with Producer Christy McGill as a part of their "Five Questions with..." series. Colin Stanfield, a very close friend of SERENADE FOR HAITI and the Nantucket Film Festival, wrote a beautiful piece on how his friendship with Owsley - "A Friendship Forged at Film Festivals, Rekindled at a Laundromat" on Nantucket. SERENADE FOR HAITI producer Anne Flatte and consulting producer Guetty Felin were thrilled to join moviegoers at the AFI Silver DC Caribbean FilmFest this weekend. We so appreciate our audiences, who time after time bring thoughtful, heartfelt questions about the film, Sainte Trinité Music School, and Haiti to our Q&A sessions.